Remember the movie/show Buffy The Vampire Slayer, about a teenage girl who hunted down dangerous supernatural monsters and slayed them? I’m sure you do. Now, I wasn’t a huge fan of the series (but I was of the movie) so I’m not sure what Buffy’s slaying career entailed. I can tell you that she’s not as tough as real-life cheerleader, 16-year-old Cammie Colin, who bagged her first gator on a hunt near Santee, South Carolina. That’s right. 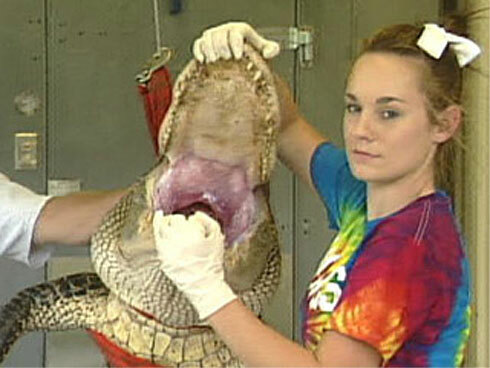 A cheerleader killed a 5-foot, 10-inch long, 350-pound alligator… with a crossbow! It’s not like the gator was in the car with her; she and her hunting party had to drag that bad boy onto the boat with them after taking it out. You only have to be 16 to get a gator-hunting permit in swampy South Carolina, and Cammie wasted no time. Southern girls are a breed of their own. I just hope they’re going to eat what they killed. Alligator is pretty tasty meat when breaded and fried. Compared to other regional dishes, it’s downright normal!